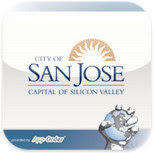 The Department of Parks Recreation and Neighborhood Service’s Anti-Graffiti/Anti-Litter Program has launched a free application called SAN JOSE CLEAN. This App allows residents with smart phones to point, click and send photos of graffiti, litter and City park conditions. Along with the picture, users can provide a brief description of the violation to assist staff that will be assigned to address the request and choose an option to receive status updates. The Droid application is currently available by visiting the Android Market, while the iPhone application is available on Apple’s App Store.